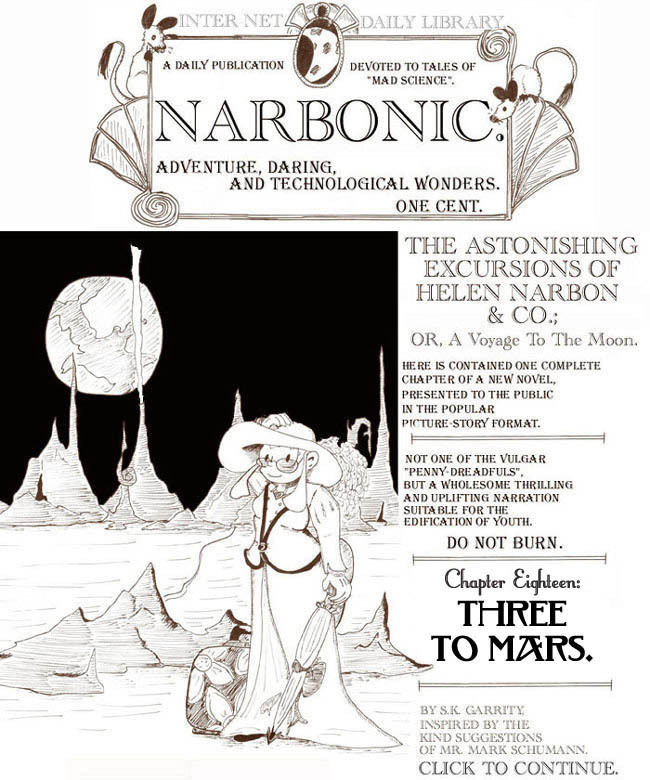 The Astonishing Excursions of Helen Narbon &Co., Chapter Eighteen. This is one of the longer installments of the Victorian story. Looking back, I can’t believe I had the time to draw this much for a Sunday feature. 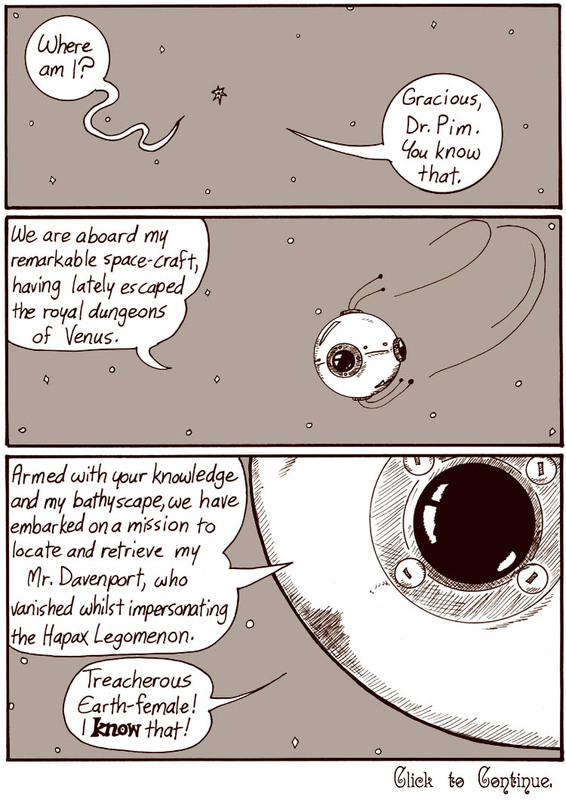 Even if one of the pages is just a little bathyscaphe thing flying around in sepia-toned space. As I’ve said many times before, I mostly made up the Victorian serial as I went along. 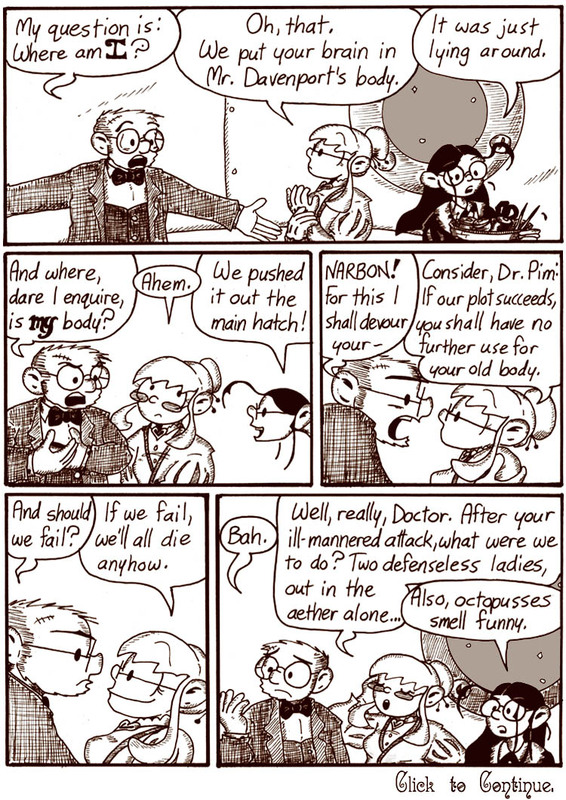 This plot development seemed like a good idea at the time, plus Dr. Pim as an octopus was kind of hard to draw. It’s a good thing Helen and Mell saved Dave’s body after all. Dr. Pim in Dave’s body has visible eyes. SPOILERS: Yes, it’s because he’s mad. The mad=visible eyes thing only really applies to Dave, but I decided to maintain it here. Anyway, Dave is fun to draw with visible eyes. I liked doing the curly bold fonts in the Victorian dialogue. The Victorian versions of the characters tend to get a lot more action than the regular versions. 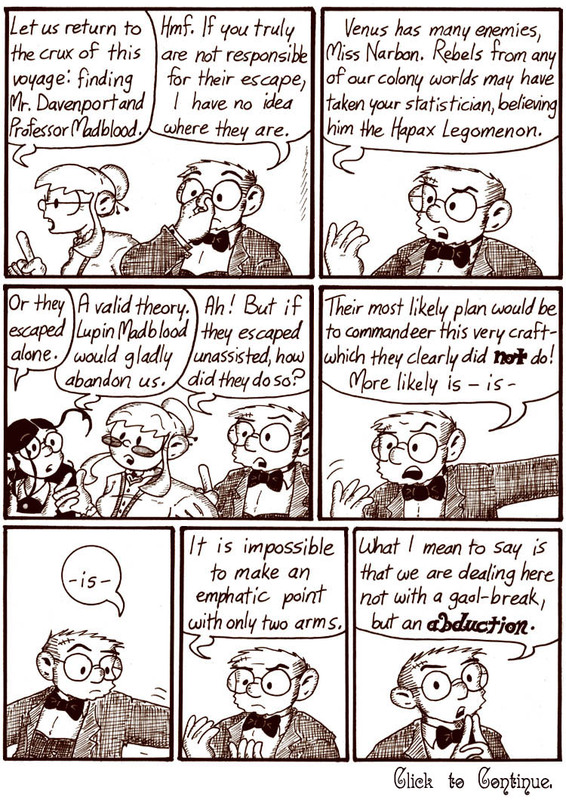 It’s like my fanfic version of my own comic strip. Mell, meanwhile, is consistently annoyed by all of Helen’s romances. This is a little bit gratuitous – but concidentally appropriate given the main story arc alongside which this episode sits. I’m very impressed that Helen managed to catch her dislocated glasses, presumably using just her face.